Sweetly B Squared: Yay Norah Jones! 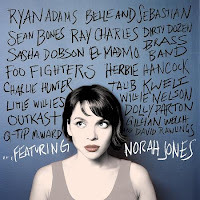 Norah Jones is definitely a very talented artist, and I've loved her music for years. This collection really showed an even wider span of her ability to perform some very versatile selections! I'd love to see more artists explore their range with collaborations, duets and cool cameos like this. My review is my personal opinion. I received a copy of the CD to review, and I am entering to win a gift card through One2One Network by participating.